I was sheathing at having to drink terrible coffee at an unnamed station – instead of the comforting Deja Brew of Coffea Robusta at Ram Bhavan (our sanskari Drone’s club). It was time to declare war. This required great planning, and everyone in the world and her husband knows that it takes the second shot of Robusta to bring out the ideas. Well there was no way out, so I had to unplug my laptop, plug in the travel coffee maker and brew the Bru just the way I like it. 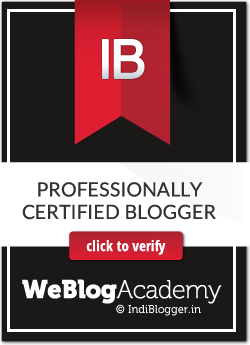 Call it synchronicity, with the coffee in Indiblogger sent an invite for the #WeBlogAcademy… out of shear curiosity I took my grade test, and guess what I cleared the intermediate and was eligible for the advanced. Still one does not take chances in a war, so it was intermediate for me. Next Post And…She Decided Not to Give Up!